PULLMAN, Wash. – Stephanie Kerschbaum, acclaimed author and associate professor of English at the University of Delaware, will present “Signs of Disability: Perception, Materiality, Narrative,” hosted by the WSU Writing Program, 2 p.m. Thurs., Feb. 7, in CUE 518, on the WSU Pullman campus. The presentation is open to the public. 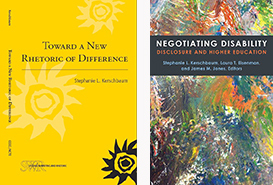 Kerschbaum’s first book, “Toward a New Rhetoric of Difference,” won the 2015 Advancement of Knowledge Award from the Conference on College Composition and Communication. In it, she addresses conversations about diversity in higher education, institutional racism, and the teaching of writing by looking at the ways people define themselves and are defined by others within institutional contexts. As a deaf person, Kerschbaum has a hard time thinking of deafness as a disability that is ‘invisible,’ given that she interacts with the world while using very visible cues, like wearing hearing aids, staring at faces while people talk, and working with sign language interpreters. In her presentation, she not only will explore what people say when confronted by disability but also other markers of difference, said Villanueva. In her first book she focuses on four specific peer review moments in a writing classroom, looking at ways students mark themselves and others, as well as how these practices of marking are contextualized within writing programs and the broader institution. Kerschbaum teaches courses on first-year writing and introduction to disability studies, and graduate seminars on writing and rhetoric. She coordinates her university’s faculty achievement program. She was a co-author on the 2017 book “Negotiating Disability: Disclosure and Higher Education,” a series of essays that explore how disability is named, identified, claimed, and negotiated in higher-education settings. The WSU Writing Program for more than 25 years has provided time-tested and innovative instructional theories and practices to teach, tutor and assess writing.